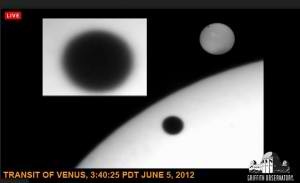 Initially I wasn’t overly excited about the Venus transit that is happening right now as I write this field report. I’m not really that into planetary science, favoring more distant and cataclysmic astrophysical events like binary black hole mergers. But the local press here in LA did a great job in the past few days to whip up excitement even in this Physics Groupie. 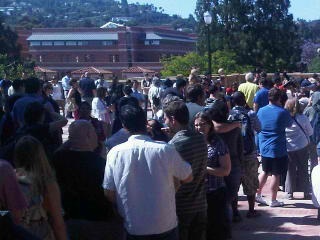 So I decided to take in the event at UCLA where the astronomy department public outreach effort was in full swing. As I approached the Royce Hall quad I was sincerely surprised to see hundreds of Venus enthusiasts lining up at one of the many specially fitted solar telescopes to get a glimpse of relatively tiny Venus marching its way across the surface of Sol. Even better, I witnessed many parents with young children in the crowd; what a great educational opportunity. 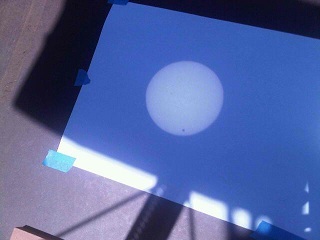 This is the first transit of Venus visible from Los Angeles since 1882, and the next one won’t be until 2117. So unless I upload my essence to an android body in the next few decades, I don’t think I’ll be writing a field report for the next passage. A transit happens when Venus passes directly between the earth and the sun, a rare occurrence due to the 3.4-degree tilt of Venus’s orbit relative to ours. From Los Angeles, Venus makes first contact with the sun at 3:06 p.m., PDT today. The planet will take nearly 18 minutes for its silhouette to completely enter the sun’s disk. Venus comes to within 9.2 arc minutes of the center of the sun’s disk, roughly midway between the center of the disk of the sun and its northern (upper right) edge, at 6:25 p.m. The sun sets at 8:02 p.m. with the transit about one hour, 45 minutes from completion. As I walked through the crowd, soaking up the appreciation the general public was showing for a scientific event, I noticed a familiar face, Dr. Mark Morris of the UCLA Galactic Center group. A nicer more affable astronomer you will not meet. It was good to see Mark again. I had interviewed him a couple of years ago for a piece of science journalism I was working on for the Griffith Observatory and it was good to see a world-class researcher supporting the event of the day. With laptop in tow, I found a nice flat surface under the Royce Hall façade to write this report while watching the activity a short distance from my perch. It is a fun day of astronomy.